The Real Estate Staging Association (RESA) is a member governed trade association for Home Stagers. RESA was formed in order to support all professional real estate stagers also known as home stagers in North America. RESA is a portal to the home staging industry and is a source of education and business tools focusing on the needs of home stagers. Members have access to up-to-date information relative to the home staging industry, marketing support services and access to home staging continuing education providers. The mission of the Home Staging Resource (HSR) is to add credibility and integrity to the home staging and redesign industry by offering the most professional and comprehensive certification staging and redesign training program available. The mission of the American Society of Home Stagers and Redesigners (ASHSR) is to develop, educate, unite, lead and promote professional home stagers and redesigners as well as the industry as a whole. The Decorating and Staging Academy (DSA) provides education, inspiration and motivation to students offering a variety of certification and learning opportunities in the areas of home staging, redesign and interior decorating. Color with No Regrets is a certification and training program with a unique color selection system blending the science of color with the power of words and numbers in order to facilitate the creation of pleasing and harmonious palettes. The Interior Design Society (IDS) is an independent national organization with more than 3,000 members strong. One of the country’s largest design organizations dedicated to serving the residential interior design industry, the Interior Design Society offers valuable education, resources, programs and professional support to their members. 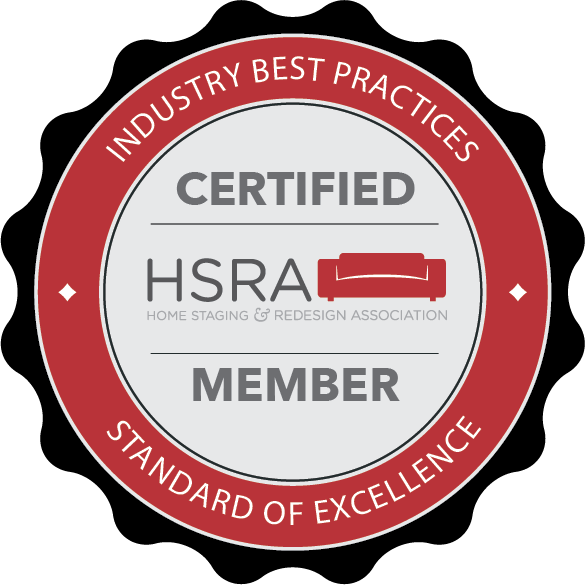 HSRA™ exists to provide expert training, knowledge, and support to Home Stagers and ReDesigners throughout the world, which ensures top service and results to our clients and business partners. The National Association of Professional Organizers (NAPO) is a group of about 4,200 professional organizers dedicated to helping individuals and businesses bring order and efficiency to their lives. Our vision is to have the world recognize the value of organizing and turn to NAPO as the leading organizing authority. Our mission is to develop, lead, and promote professional organizers and the organizing industry. Staging a home BEFORE listing it could save thousands of dollars with less time on the market. Contact us today!